2017 Hyundai Veloster Street Turbo: Car Review | | A Wheel Thing. 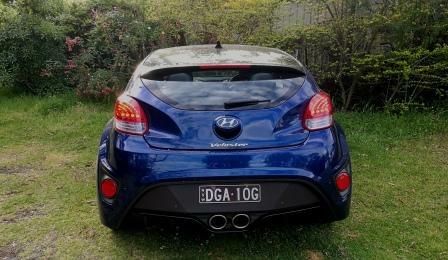 Hyundai’s quirky four door hatchback, the Veloster, has been given a limited edition model run of just 200 units. 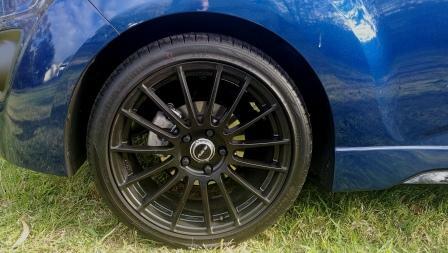 Painted Dazzling Blue Mica and given some cool looking black clad alloys, the Veloster Street Turbo spent a week with A Wheel Thing. With a starting price of $35750 plus on roads for a six speed manual version and $2500 for the seven speed dual clutch auto, the Veloster Street Turbo is off to a tough start. 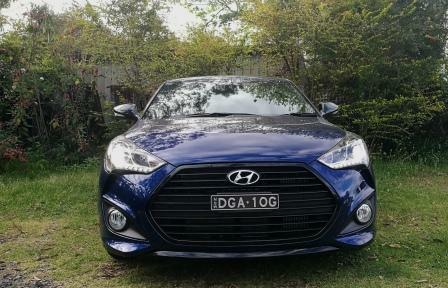 Using the outgoing Veloster SR Turbo + as a base ($34750 + ORCs), as Hyundai have realigned the Veloster into a two tier range, means that some extra equipment is required to justify the cost. 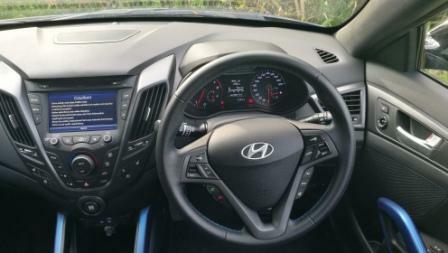 Here’s what you get: push button Start/Stop, keyless entry, dusk sensing HID xenon headlights, LED running lights, tyre pressure monitoring, a seven inch navitainment touchscreen (but no RDS, Apple CarPlay/Android Auto or digital), leather appointed seating with colour coded inserts, colour coded plastic highlights on the door grips and centre console, blue seatbelts, branded door mats and Street badging on the fenders and the sweet looking Ray Grams Lights 18 inch alloys. Being based on the SR+ you’ll get steering wheel mounted phone controls, Bluetooth streaming, heated AND ventilated (huzzah!!!) 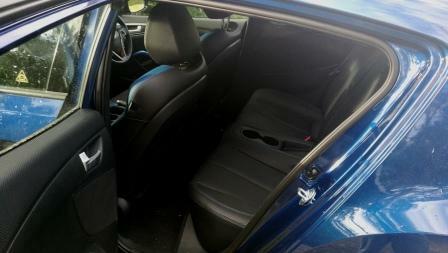 front seats and a punchy eight speaker sound system. Up front is the same 150 kilowatt/265 Newton metre 1.6 force fed four. That’s connected to the aforementioned six speed manual and this, unlike the recently tested i30 SR, has a far better manual selector feel. There’s a proper sense of movement and placement, a satisfying “snick” to the gate and a real mechanical feel overall as opposed to the numbness experienced in the i30 SR. That torque is available between 1750 and 4500 revs, and compared to the last time A Wheel Thing and Veloster Turbo partnered up (Veloster Turbo review 2015) didn’t seem to move the car along as quickly. Perhaps it would be the manual versus the auto, it simply didn’t feel as wound up. 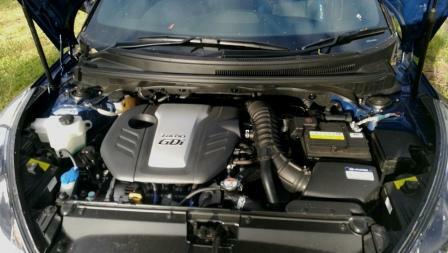 Having said that, it still provided a tractable and useable driving style, with a smooth and fluid torque delivery. The ratios in the manual are closely stacked, meaning revs drop only minimally when changing, and also means you can keep the engine spinning and take advantage of the torque from 1750 onwards. It helps that the clutch has a decent pressure requirement to push and that the pickup point is appropriately mid travel. The combination allows a sporting aimed driver to bang through the gears and see 100 kmh reasonably quickly. Given that the car isn’t that heavy as well, at around 1400 kg, the overall fuel consumption figure of 7.9L/100 km was reasonable from the fifty litre tank. 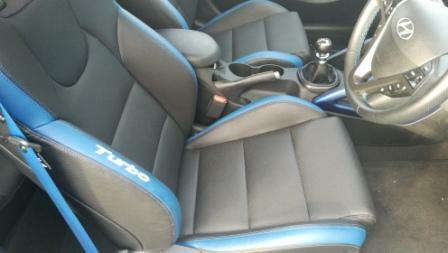 Inside, apart from the blue trim, the Veloster remains much the same. The design and look of the plastics is dating and not well, there’s sharp edges on the door grab handles however the deeply bolstered and very comfortable bucket seats make up for that. Being the oddity that it is in regards to entry and exit, the driver has slightly less issue in getting in and out thanks to the single door on the right hand side. Those using the left side, especially the rear door, will have to duck their head and slide across the centre rear seat mounted cup holders in order to fill the space behind the driver. Rear head room, thanks to the steeply raked roofline, is a touch tight for average sized humans, ok for kids but would be, erm, difficult to deal with for anyone of a bigger frame. 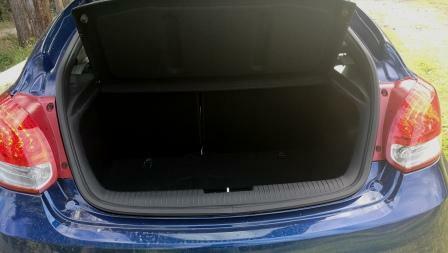 There is, though, a 320 litre cargo space and a space saver spare to consider. There’s more refinement in the suspension, with a taut yet supple suspension combination providing a ride that errs on the side of sport but with just enough give to not rattle the fillings on smooth roads. 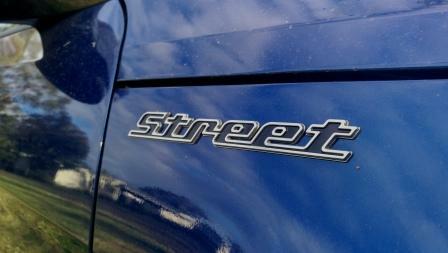 Toss the Veloster Street onto anything else and expect a choppy, jiggly, teeth rattler. That initial level of sporting compliance disappears and there’s even some sideways skip when covering a corner with ripples or broken surface, even with the 225/40/18 Hankook rubber. Hyundai painfully continues with the three mode power steering and it’s rare that any one the modes (Comfort/Sport/Normal) tend to be on the money. Sport generally comes over too heavy, Comfort too light and well, just like the porridge, Normal is generally all you need for a reasonable facsimile of a communicative tiller setup. Be the first to comment on "2017 Hyundai Veloster Street Turbo: Car Review"